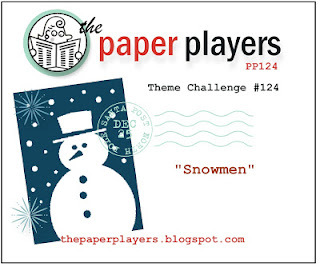 H2 Designs: The Paper Players Challenge #124 - Snow Much Fun! The Paper Players Challenge #124 - Snow Much Fun! I used the smallest Holiday Ornament die to make the snowmen, trimming off the hanger section & the point at the bottom. I used a bunch of punches to add their bits & pieces (see below) & trimmed some branches from a tree die-cut (courtesy of the lovely Bronwyn Eastley *waving madly to you Bron*) to make their arms. The eyes are the smallest size pearls, coloured with a permanent marker.